Through strange occurrences that bring him into contact with a host of geometric forms, Square has adventures in Spaceland (three dimensions), Lineland (one dimension) and Pointland (no dimensions) and ultimately entertains thoughts of visiting a land of four dimensions--a revolutionary idea for which he is returned to his two-dimensional world. Charmingly illustrated by the author, Flatland is not only fascinating reading, it is still a first-rate fictional introduction to the concept of the multiple dimensions of space. "Instructive, entertaining, and stimulating to the imagination." -- Mathematics Teacher. Fifty Years in the Flatland 2012 will mark the 50th anniversary in print with Dover of one of the most significant and influential books of the past century and a half. The mathematical, satirical, and religious allegory Flatland by a little-known but immensely prolific Victorian English schoolmaster and theologian Edwin Abbott Abbott, was first published anonymously in England in 1884 -- Abbott wrote it under the name "A Square." 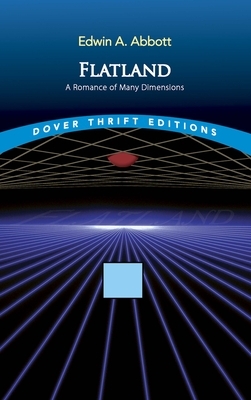 The unique geometrical romance which is Flatland posited a world and its inhabitants that exist in only two dimensions and forces the reader captivated by the originality of this central idea to think deeply about the meaning of such a world. Generations of readers and students swept into the romance and fascination of geometry and other branches of mathematics and philosophy owe their introduction to this world to Flatland, which continues to entertain and stimulate new readers today, still going strong 126 years after the first edition was launched. Abbott revised the text somewhat for a second edition published just a few months after the first. Dover's 1952 edition was the first American reprinting of the amended second English edition and was published with a new Introduction by physicist Banesh Hoffmann. From the Book: "I CALL our world Flatland, not because we call it so, but to make its nature clearer to you, my happy readers, who are privileged to live in Space. Imagine a vast sheet of paper on which straight Lines, Triangles, Squares, Pentagons, Hexagons, and other figures, instead of remaining fixed in their places, move freely about, on or in the surface, but without the power of rising above or sinking below it, very much like shadows -- only hard and with luminous edges -- and you will then have a pretty correct notion of my country and countrymen. Alas, a few years ago, I should have said 'my universe': but now my mind has been opened to higher views of things."